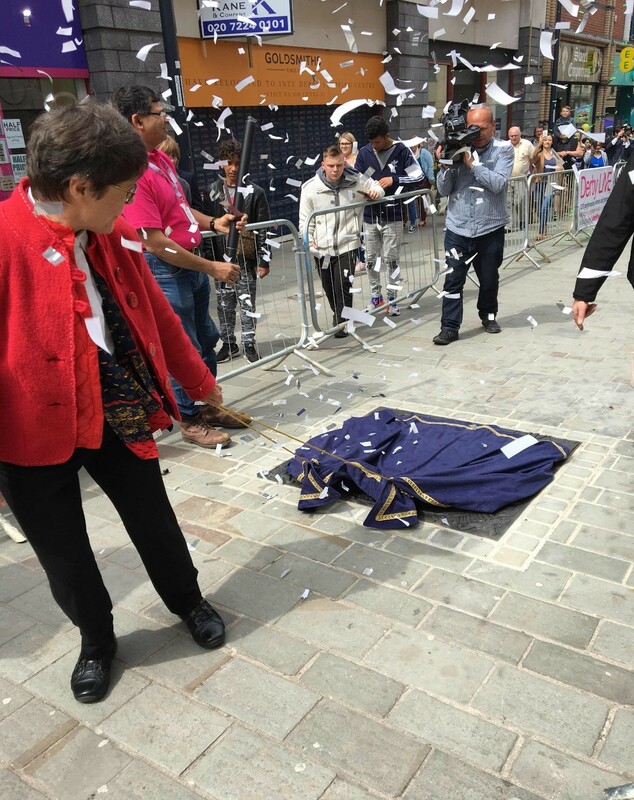 Suffragette and WILPF activist Alice Wheeldon, who was wrongly convicted of trying to kill Lloyd George, has finally received the recognition she deserves with her very own star on Derby’s Walk of Fame. Her granddaughter Chloe Mason writes about the celebrations surrounding Alice’s star being revealed. part of the Made in Derby campaign. We were joined by the stalwart Betty Keeling whose family supported Alice Wheeldon in many ways, including caring for Alice after she was released from prison by the Prime Minister, David Lloyd George. 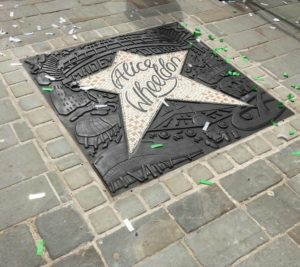 Alice Wheeldon was awarded a star on the Walk (Albion Street) with 7 other well-known Derbyites including Bess of Hardwick who helped build the Chatsworth Estate, Charles Rolls and Sir Henry Royce (say no more), who built their factory in Derby, and Sir John Hurt, a well- known British actor. Alice’s star sits next to Philip Noel-Baker, a CO in the First World War, peace activist, and educator. Chloė unveiled the plaque with a cloak under a shower of silver confetti. The inclusion of Alice Wheeldon in this ‘walk of fame’ is a great achievement for public education and support for a strong-minded woman suffragist, anti-war activist, socialist in Derby. She had a fine network of friends and associates who supported her and her family during their trial in 1917, imprisonment and persecution. It’s fitting that Alice’s star is next to the star for Philip Noel-Baker. He was CO in WW1 and went to the Hague conference, where he would have met women from WILPF! There was heaps of publicity with local press and TV coverage including of Chloe, and serious talk of a feature film about Alice Wheeldon with Lady Anwen Hurt. A wonderful tribute to Alice!